Is Progressivism, and the outrage that goes with it, a new religion? Dave Chappelle recently released a new special on Netflix talking about Outrage Culture and #MeToo and Louis CK … and people are upset. From twitter to the Huff Post, people are outraged about Mr. Chappelle’s criticism of Outrage Culture. Let the irony sink in for a minute. The Tocqueville Effect is in full effect. Indeed, it appears that since the rise of the Baby Boomers in the West, we have replaced Christianity with a new “progressive” religion, Outrage Culture. On closer inspection, you realize how much traditional Christianity and “outrage culture” religion share in common. Both adhere to a strict dogma, which is if one does ascribe to they are subject to intense public shaming and scrutiny. For the former, it is a firm belief in one male one female marriage, strong family units, chaste behavior, and a belief in god. For the latter, it is a firm belief that men and women are the “same”, gender is a social construct, only white people are capable of bigotry or in-group bias, that equality of outcomes is the only form of equality, that enforced diversity is a form of freedom, and a belief in Scientism as the new god. Most importantly, both religions share the idea that if one does not publicly profess their faith in the tenets of that religion, then they are “evil”. In other words, it is not just the progressive, feminist, and/or social justice ideals that define this new religion, but critically the moral outrage and victim mindset that goes along with it. Witch hunts and persecutions are common. Hell, you can even lose your job or means of living if you don’t fall in line. 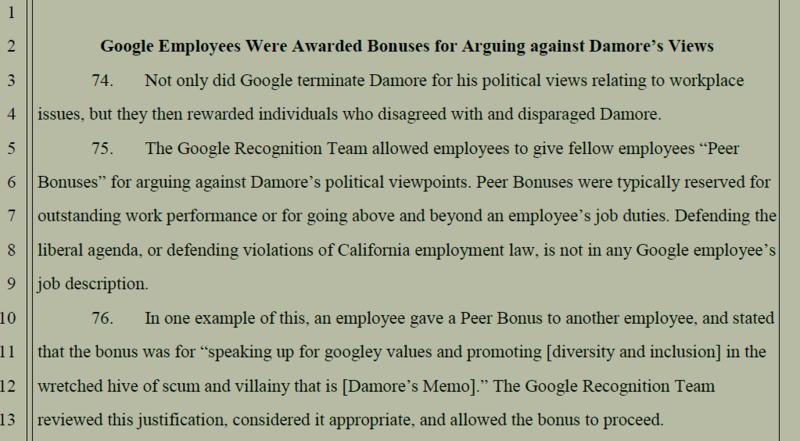 Just look at the James Damore case at Google for example, even to the point of giving monetary bonuses to employees who disparaged him and his non-politically correct views. It is not just a set of beliefs, but a dogmatic system that can cost you your life and/or livelihood. Not to mention that of your family’s. Spanish Inquisition sound familiar? And what is really ironic, is that the last few generations have spent the past half century thinking they were “tearing down” religion … no, my friends, you were just replacing it with a new one. It seems the human brain is hard-wired to need something to believe in, something to rally around, something to bind the tribe together. To differentiate between them and us. Something to despise. I have written before about the Tocqueville Effect (see link above). In short, it posits that as social conditions and opportunities improve, social frustration grows faster. Social justice and like just bring on more fervent opposition to ever slighter injustices and grievances. We lose sight of where we came from, become entitled, and, in popular idiom, “bite the hand that feeds us”. It’s a strange but observable phenomenon in many modern day democracies. Such Presentism – the practice of applying myopic modern day viewpoints to past events or people – is a big component of the Tocqueville Effect, and rampant in Outrage Culture as well. Every generation thinks: it will be different this time. That they know better. That they are “smarter” than everyone who came before them, more enlightened. But such thinking is easily proven wrong, each generation is not so different after all. Ryan Holiday’s excellent recent book, Ego is the Enemy, really tackles this phenomenon head on. Because Outrage Culture really is a manifestation of ego. Or more so, an excessive focus on ego. A preeminence of our feelings over all else, over reasoning and logic. If we feel aggrieved, then it must be so. Which begs the classical philosophical question: Is God really just a manifestation of human ego? And if it all is really about ego, then is it truly wise to replace a religion of restraint with one of excess? This entry was posted in Uncategorized and tagged Bigotry, Christianity, Cultural Narrative, Dave Chappelle, Ego, Feminism, Google, in-group bias, James Damore, Outrage Culture, Political Correctness, Presentism, Progressive, Progressivism, Religion, Ryan Holiday, Scientism, Social Justice, Tocqueville Effect, Transgender. Bookmark the permalink.